Fruit; below medium size, roundish oval, regular and handsome. Skin; fine clear yellow, faintly streaked with bright orange, covered with russety freckles. Flesh; yellow, tender, crisp, very juicy, brisk, rich and highly flavoured. [HP pl.III/1878]. ‘This Apple is held in much esteem by the amateurs of fruit generally, and is spoken of in terms of very high commendation by Mr. Billingsley, in his “Survey of Somersetshire”, in which county it is said to have been recently raised, at the place from whence the name is derived, from a seed of the Golden Pippin, which variety it somewhat resembles both in form and colour; though it is usually larger.’ [PL pl.32/1818]. Described and figured in the Pomological Magazine. ‘A Somersetshire Apple of the highest merit. It was originally raised in a village in that county, from the seed of the Golden Pippin, to which it is little inferior either as a cider or table fruit. The tree is very healthy and vigorous, and a great bearer.’ [PM t.32/1828]. ‘It is one of the best and most valuable dessert apples.’ Ripening in October to November it will keep until March or April. [Gard. Chron. 1846]. 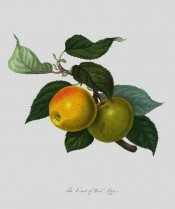 Listed in 1845, 1850 and 1857 catalogues [Apple no.32/1845]. Incorrectly called Country Wyke Pippin in the 1845 catalogue.